Call us to schedule your next BMW service appointment! Eastern Autowerks offers complete BMW repair at our shop located in the heart of Norfolk, Virginia. This makes us a short drive from anywhere in the Southside Hampton Roads area, including, Norfolk, VA, Chesapeake, VA, Virginia Beach, VA, Portsmouth, VA and Suffolk Virginia. We are your local, experienced and trusted BMW maintenance and BMW repair facility. There is no other vehicle that matches the perfectly engineered BMW. You should only trust a BMW expert with all of your maintenance, repair and service needs. Let us be your trusted expert to take exquisite care of your BMW automobile. Why pay dealer price and wait on a dealer time schedule? Come to where customers and their vehicles have been taken care of for over 25 years, exclusively BMW, so you know you are getting the best of the best. Our experienced team provides BMW repair to get your vehicle back on the road safely. Our team of expert mechanics are fully trained and knowledgeable on BMW's. The German engineering inside every BMW makes the vehicle great. However, the complexities and intricacies of the vehicle should be repaired by a BMW expert. When it comes to BMW maintenance, it is important to reference the owner's manual to understand when to have maintenance performed. Preventative maintenance is important to keep an engine running efficiently and avoid damage & costly repairs. Our BMW service team makes it easy for you to get preventative maintenance performed on your vehicle. We are committed to providing BMW service and products to luxury import car owners who expect high quality and a great value. With over 25 years of exclusive experience we meet the needs of our customers through expert diagnostics, factory and OEM parts at an exceptional value. Our BMW service in the Norforlk, Virginia Beach and Chesapeake, VA areas are unmatched. Please call us today for BMW service! Looking for BMW service near you? Your choice of vehicle for navigating the open roads of Virginia Beach, VA, in many ways, reflects your style and values as a consumer. If you have chosen to favor the smooth acceleration, tight handling, and sheer beauty of the BMW, you are surely a customer with a knack for quality and a taste for elegance. Schedule an appointment today and get back out on the road in an efficient and timely manner with our reliable BMW service. A Full Service BMW Repair Facility serving Norfolk, VA, Virginia Beach, VA & Chesapeake VA. Call or Click today for your Appointment, (757) 296-0189. We offer professional BMW maintenance at an affordable price! Our BMW maintenance has always been delivered with second to none customer service and know-how. By providing the best in parts and service in a fully equipped, state of the art repair facility we have become Norfolk, Chesapeake, and Virginia Beach’s premier BMW repair outlet. Click here for BimmerShops reviews on our company from some of our customers. Remember when you are in the Norfolk, Virginia Beach & Chesapeake, VA area looking for BMW maintenance, you can rely on the pros at Eastern Autowerks! Once you pull into our parking lot and walk into our repair facility, you will immediately feel welcome and appreciated. We want you to enjoy coming to see us as much as your vehicle does! Have a cup of coffee or tea, grab a snack out of our machines, play a game of pool, or just relax on our luxurious leather furniture or café table in our meticulously decorated lobby and soak up some television. We want to make you comfortable with your surroundings and not just our work. Randy, Tracy, and the staff will have you and your BMW taken care of in a timely and courteous time frame. Our current and past customers will recommend us 98% of the time and we hope to include you in those numbers. Click here for more reviews on Eastern Autowerks. Our owner, Randy Ray, has spent his life in the auto repair business. For over 25 years he has honed his knowledge and skill working for other dealers, and for himself. He is an expert at diagnostics and repair and is always willing to break it down and explain his findings. He holds current BMW certification as well as ASE certification for all your BMW maintenance needs. He is strong on customer service and values the loyalty and good will he has acquired over the years. He has many long term customers who will trust no one else to work on their cars. His reputation for honesty, integrity and professionalism has never been compromised. Tracy Lamar-Ray has a BS degree in Biological Sciences and over 15 years of business experience ranging from direct marketing to management. She is a firm believer that exceptional customer service is the cornerstone of any successful business. At Eastern Autowerks, we do things differently, call today for your appointment (757) 296-0189! We offer a radical approach to car care….a partnership between car owner and technician. This facilitates honest dialogue between the driver and the mechanic. As with any well understood technology, we will get to know your BMW and its “personality”, not just fix and forget it. Click here to request an appointment. We are BMW enthusiasts with a passion for import automobile safety and performance. From the front door, to the back of the shop, you will feel you have brought your BMW to the right place. 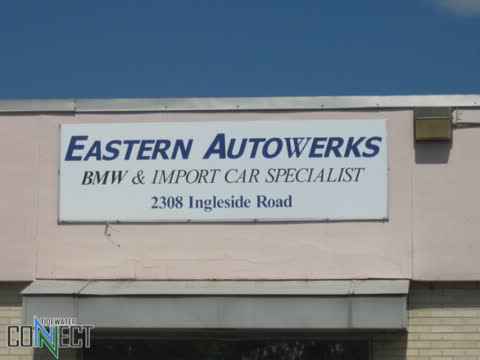 The only place for BMW maintenance and BMW repair in Chesapeake, VA or Virginia Beach, VA – Eastern Autowerks. We pride ourselves on taking time to explain what service your vehicles’ needs, why it needs it and how much it will cost. We know you love your BMW, and we want you know understand what we have done to keep you rolling. With such sophisticated machinery, there is a level of expertise and understanding needed for you and your vehicle. We believe that a one on one consultation is an essential part of the diagnostic process. This is essential in the repair or maintenance of your BMW, just as an ache or pain would be to a doctor. It helps us understand each other and effectively address your needs and the needs of your BMW. Call Today for your Appointment (757) 296-0189, And don’t forget to tell us how you found us! BMW maintenance, repair, and service of all kinds – oil changes, routine maintenance, engine repairs and diagnostics, brake service. We also provide a full range of repair & maintenance services in Minis, Sub, Range Rover and Lexus.